Jordan Maglich, who runs the Ponzitracker Web site, has made public a huge Ponzi scheme database detailing more over 500 fraud schemes. NEW YORK (TheStreet) -- The first decade of the 21st century goes down as the "golden age" for Ponzi schemes. In the aftermath of Bernard Madoff's epic 20-year scheme to defraud investors -- which Ponzitracker founder Jordan Maglich estimates cost investors $17 billion -- most potential victims know that a Ponzi scheme promises investment results that far exceed the returns one can expect form a "normal" investment. Ponzi schemes ultimately collapse when the person committing the fraud runs out of new investment money to pay to previous investors. Maglich has developed and made public a Ponzi database, which he calls "a comprehensive list" of all Ponzi Schemes during the "Madoff era," including over 500 cases of fraud. The database is sorted by year, and then by declining estimates of losses to investors. There's a column with links to articles or announcements by government authorities of the arrest or discovery for almost every listed scheme, with another column including links to to articles or announcements describing the fraudsters' prison sentences. To use one of the links, first click the dollar amount in the "Losses/$ at Issue" column. A small box will appear. To the right of the word "Exclude," at the top of that box, click the little table icon, which will bring up another box that includes all the data, including the links that you can copy. The data on Ponzi schemes included in the database was complied by Maglich, with a major contribution from Chris Marquet, who runs the FraudTalk blog. The data visualization was prepared by Dynamic Securities Analytics. Here are the four Ponzi schemes in the database that led to estimated investor losses of over $1 billion. Madoff, of course, takes the top Ponzi prize. Not only did his scheme run the longest, it cost investors the most. And JPMorgan Chase (JPM - Get Report), whose main banking subsidiary was Madoff's bank, really took it on the chin, eventually entering into a deferred prosecution agreement with the Department of Justice, and agreeing to a total of $2.6 billion in fines on Jan. 7. The fines were in part covered by litigation reserves the bank had previously set aside, but they still lowered the bank's fourth-quarter after-tax earnings by $850 million. Madoff plead guilty, refused to cooperate with prosecutors or with efforts to recovery money for his victims, and is serving a 150-year term in federal prison. Next is Allen Standord, who perpetuated a scheme leading to an estimated $7 billion in losses to investors, on deposits made in Stanford International Bank in Antigua. These deposits paid above-market interest rates, while a great portion of the money was used by Stanford to fund other investment schemes, falsifying the bank's records and customer account records. Stanford is serving a 110-year federal prison term. 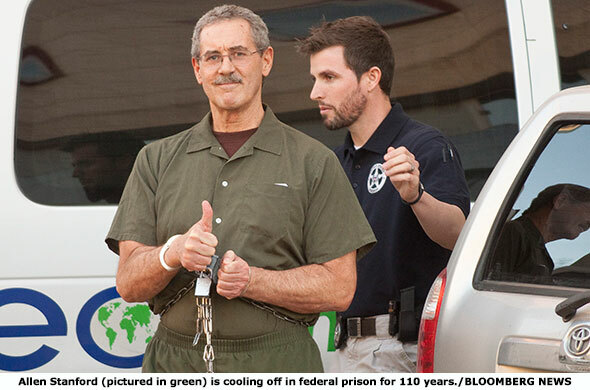 Thomas Petters ran a Ponzi scheme leading to an estimated $3.65 billion in losses to investors. Petters and associates attracted money from investors and lenders by falsifying retail sales records and bank statements. The money was supposed to be used to buy merchandise from suppliers and sell it for a profit to retailers, but that business never occurred. New money was used to pay off previous investors, with Petters and associates creaming off the top to fund other schemes and what court documents called "lavish" lifestyles. Petters is serving a 50-year federal prison term. Scott Rothstein ran a Ponzi scheme for five years, leading to an estimated $1.2 billion in losses to investors, as described in detail in Why 'Sophisticated' Investors Fall for Ponzi Schemes. Rothstein is cooperating with federal prosecutors who are keeping his whereabouts secret. He is serving a 50-year prison term, which prosecutors hope to have reduced in light of his cooperation. To banks that provided services to Rothstein's defunct law firm paid very heavy fines for not reporting his suspicious activity, which included large numbers of massive checking account overdraws. TD Bank (TD - Get Report) "ultimately paid over $600 million in restitution to investors impacted by Rothstein's Ponzi scheme," the Securities and Exchange Commission said. Gibraltar Private Bank & Trust of Coral Gables, Fla., also did business with Rothstein's firm, and agreed in February 2012 to pay $10 million to a group of Rothstein investors, and in August 2012 agreed to pay $15 million to the trustee for the bankrupt law firm. "There is some measure of consistency in that the top three Ponzi schemers got commensurate sentences, and set the standard against all Ponzi schemes are seeing measured now," Maglich says.